It's early evening in late March, and the sunset is flooding through the windows of an open studio for teens in southwest Detroit. Karla Rodriguez, a 9th grader at Cass Tech High School, leans intently over an intricate line drawing with a calm focus, slowly expanding the design across the page. Other students around the room are also quietly immersed, all lost in various stages of sketches or painting. These teenagers are enrolled in The SPOT, an open studio that emphasizes unstructured studio time, student-curated guest artists, and field trips to local studios and galleries. 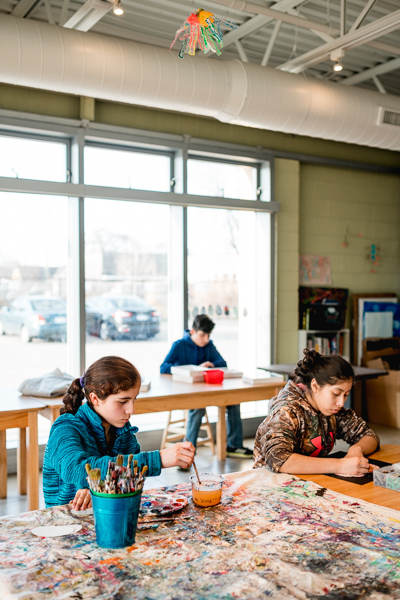 A part of nonprofit Living Arts' curriculum for adolescents, the studio centers around the idea that students thrive artistically when given time to wander creatively without the pressure of assignments. The laid-back, self-guided nature of the session is why Rodriguez has attended regularly since 2015. "I'm usually stressed out most of the week with school work," she says. "When I come here, I get to relax. It's good to not stress about anything and just get to do whatever you want." Living Arts director of programs Erika Villarreal Bunce says the studio's focus is based on what teens need the most to flourish as artists. "Adolescence is a time when students can and should be making decisions about their learning experiences," she says. "And they are really quite good at it when they have the right amount of guidance and support." Located in the Ford Resource and Engagement Center, the studio space is chock-full of art, from the paintings and photographs lining the walls to the mobiles made from shredded plastic bottles hanging from the ceiling. Materials for wire sculptures, print-making, and paper mache all have designated containers, ready for use, and iPads are available for everything from song recording to digital illustration. In a typical session, seven to 10 students can be found absorbed in their work. Some might be working solo in a focused manner, while others might be chatting with each other or the teaching artist overseeing the studio. Since there are no objectives or assignments, the room has an overall relaxed feeling. Everything that happens in this time is determined by each individual student leading his or her own artistic exploration. The SPOT was initiated in the summer of 2014 in response to teens' low and inconsistent enrollment in Living Arts' Out-of-School Art Program. Concerned, Villarreal Bunce and her colleagues dug into national research and knowledge curated within the organization that showed teens want more freedom over how they spent their time artistically. They also found that students respond better when the hierarchy of the arts teacher as a "master" is discarded and replaced with a model where teachers are mentor figures on equal ground with students. "It's our job to be a 'guide on the side' for students, not a 'sage on the stage,'" Villarreal Bunce says. "We see ourselves as partners with the young people in our studio." Teachers are chosen based on their ability to relinquish control to students. "These are teachers who are really good at creating open-learning situations that involve a lot of youth voice," she says. "They give young people the space to say what needs to happen in an art studio and also give them accountability for how the studio is run and where it's all going." Stephanie Howells recently served as the teaching artist of The SPOT for the first three months of 2018. She often used the time to develop projects for her 2D and 3D art classes she teaches through Living Arts. Working alongside the students, she would often ask them for feedback or help with working out kinks in the assignments. Howells says this reciprocity and co-learning provided a much-needed break from the "performance" aspect of teaching her other classes. "Personally, I love the space," she says. "It's just as healing for me as, hopefully, it is for the students. I don't have an open studio, I don't do it for myself. That's why it's so special for me, too." Outside of Living Arts, Howells curates community exhibitions centered around social justice and community healing through art. 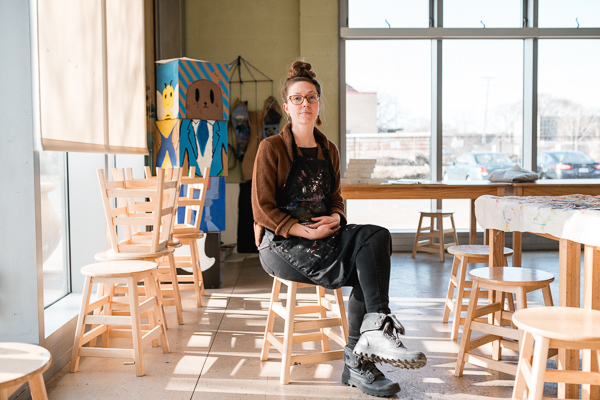 She brought this focus to The SPOT by inviting students on a trip to The Alley Project, a program put on by the Detroit Collaborative Design Center that transformed an alley in southwest Detroit into a street art gallery. The students take field trips across the city, including multiple trips to the Detroit Institute of Arts and even chocolate-making excursions to Bon Bon Bon. They've also presented their own open studio at a professional conference in Troy. The artists themselves rotate frequently based on what students are interested in learning. "The cool thing about rotating the teaching artist in the space is that we each have our own medium and technique and personality," Howells says. "Students can develop relationships with different artists and learn from their expertise." An array of artists have visited The SPOT in recent years, including visual artists Mary Kate Hoffman and Michelle Souliere, dancers from the Ann Arbor Contact Improv, AcroYoga practitioner Justin Alesna of the Suttle Dance Company, and jewelry maker Rebecca Willens, among others. Though her tenure in The SPOT ended in March, Howells says her time there influenced her approach as an instructor. "The SPOT's format has influenced even my teaching style in my other classes, where I'm loosening the reins a little bit. Because I've witnessed the magic when students have the freedom to create what they want," she says. The SPOT's current teaching artist is Sterling Toles. A working musician, Toles teaches songwriting and recording in a number of Living Arts' in-school and out-of-school classes. 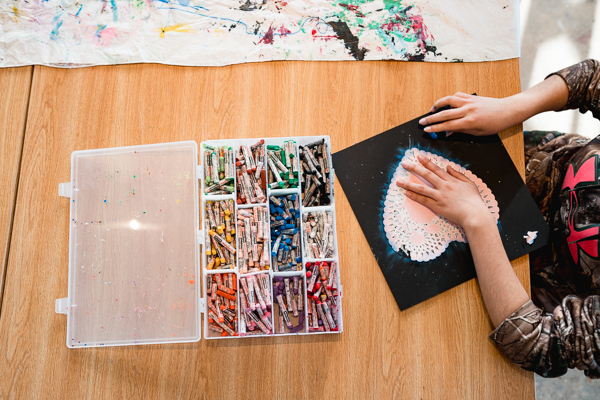 He says the SPOT's open studio time allows students to take everything they've learned and create their own artistic path; one that is not dependent on anyone else. "I just love people being able to create authentically without needing to make a product or even something that people will like or understand," he says. "Rather, they are doing it for themselves. Because that's the cool thing. You can be your own favorite artist." Read more articles by Amy Oprean. Amy Oprean is a Detroit-based freelance journalist, comedy writer and storyteller. You can follow her on Twitter @AmyOprean.